(Nanowerk News) Orange Maker™, the LA-based 3D Printing technology startup, announced a revolutionary new 3D printing technology (patent-pending), in addition to a professional-grade desktop 3D printer product line. Orange Maker’s proprietary Heliolithography™ (HL) printing process displays significant improvements versus conventional Stereolithography (SL), the standard of professional-grade 3D Printers on the market today-- by offering greater theoretical limits on printing speed, options for a superior variety of compatible printing materials, smoother surface finishes, and a level of detail not achievable in current desktop printers. “Quite simply, we’ve found a way to streamline efficiency, design, and material economy in 3D printing, a medium that has hitherto suffered from restrictions on variables such as size, speed, and availability of materials," says Kurtis Dudley, inventor of the process. "We’ve reached an ideal—greatly expanding functionality while achieving elegance and simplification through design and engineering." Orange Maker’s HL innovation provides a solution for all current 3D Printing technological issues, including, but not limited to: poor reliability, slow printing speeds, inadequate build volumes, poor surface finishes, and low resolution, while still lowering consumer costs, with the Helios™ One. Developed for the professional designer, engineer, artist, or business, Helios One™ is the first in a series of HL 3D Printers, designed and manufactured by Orange Maker™, which addresses the key market needs listed above. 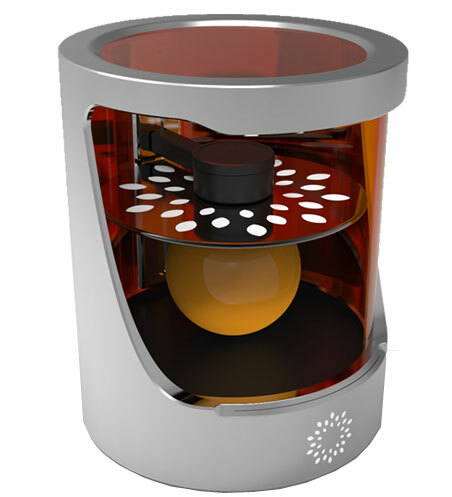 Providing a powerful and reliable platform through Orange Maker’s patent-pending photopolymer-based HL printing process, Helios™ One directs UV light with ultra-high precision to solidify liquid resin through a ground-breaking curing process, and combines world-class aesthetic design with professional grade engineering, yielding the most impressive desktop 3D printer yet. Helios One™ projects to be available for purchase directly from Orange Maker™ as well as from select third-party distributors and retailers in 2015. The company’s founders - inventor and 3D artist, Kurt Dudley, and technology entrepreneur, Doug Farber - began collaborating in 2011. Inspired by the possibilities of 3D Printing technology, Dudley invented his own technology to advance the capabilities of 3D Printing. Led by Patent Attorney, Michael Ram (Koppel Patrick Heybl and Phillpott), and with direction from business and legal strategist, Paul Sipio, Orange Maker began filing patents on their system. Joined by Chris Marion, lead product designer and engineer, Orange Maker™ began developing the first product line to release to the prosumer market. Orange Maker's purpose-- to design a simple, professional, end-to-end 3D printing system that provides high-quality technology for use in home or office-- was fulfilled through this collaborative team, and is independently funded to this point.